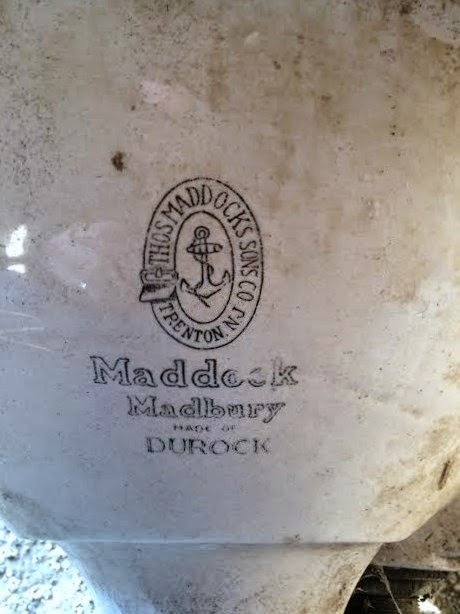 Plumbing Geek Blog: Learning Thomas Maddocks and more. Client: Looking for faucets for an integrated spout Thomas Maddock sink. Brian: I have those faucets and have been looking for a sink. What model is it? How about a few photos. Client: It's really in good shape. I little dirty from sitting in the barn for 20 or so years. 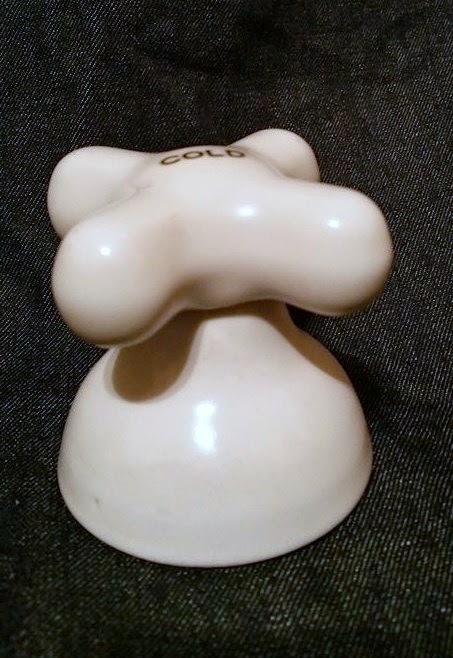 It has a pencil or 'peg-leg' pedestal. I will send a better pic of the whole thing once I clean it up. I have some handles and escutcheon pieces that I think will work. That would be awesome if you had some valves I could use for this project. Brian: As I had hoped it is a "Madbury". I have everything but the drain pop-up assembly. I will get you some pix of the handles, they are special. Somewhere I have a photo of the original catalog page. I will piece it together and send you an email. Let me see what handles you have please. "All metal parts above the slab are completely covered with china." It was the supper sanitary look that was craved at the time. Kitchens and baths were all white, white, white. I see that you have the drain pull still, if it is original it has the same feature. There is a slight cupping at the bottom of the pull that fits neatly over the metal hold down of the escutcheon. I had a client print a page from the internet, this was before I had my own Maddocks book. He had a Maddocks lavatory like yous but with the full size pedestal, not the stiletto pedestal. In it were the valve bodies only, no stems, no trim. He wanted me to not only complete the faucets but to make it all original as in the photo. It was a real challenge to me and I dove into it. Being challenged is what plumbing-geek is all about, it is what has taken me from plumber to artisan. In the course of the next year I researched and resourced Maddocks valves and trim. When I found extra on e-bay I picked it up. I had fresh stems made by my faucet specialty machine shop. Enough for the one project plus more to complete the extra valve bodies I had found. Almost no one has the understanding of this fixture that I have attained. "Thomas Maddock's Sons Co." simply referred to as Maddocks stems are not in any of stem replacement catalogs, not even the vintage specialty companies I use for the normally no longer made parts I get for people. I had these stems made special, to my specs. I had to send the valve bodies to Colorado and talked to the machinist at length to get the specs right. The most difficult part was the drain assembly. I found an original but the guy would not part with it once he understood how rare it was. In order to secure it I had to design and fashion a replacement part for his restoration project, we then did a swap. I actually fulfilled the task of creating what there was only a vintage photo of. It took about a year to manage it. In the end my client had no appreciation or understanding of the journey I had undertaken for his project. The completed fixture, assembled and installed, secured to the wall with vintage brackets was a triumph for me but a simple expense to him. Other facets of his extensive remodeling had run over budget by then and I was just one more guy with my hand out. I had taken nothing up front, I never have. The fixture restoration and installation was my task, the rest of the remodel plumbing was being done by a regular plumbing contractor. I tried early on to get the drain they had installed lowered but the response was, "Are you sure it needs to be lowered?" I took my measurements and told them it would make it by a quarter inch, so we let it stand. The thing is though that at that time I was planning to use a non-original drain assembly. I had no idea that an original would become available. When it did, later on, the client would not settle for less. The wall in the meantime was closed and the drain was too high. I was on budget, exactly as I had proposed. The client thought that I should lower the drain at no extra cost and I deferred. I had already provided the original drain at no extra cost though I had to make gaskets for it as well acquire it. Another contractor lowered the drain and installed my drain assembly, I did not get my non-original drain assembly back. Much later, to my great surprise, I was paid the bid amount. The client seemed so bitter that I had thought that the job was going to be a total loss. You are probably wondering why I have related this story to a prospective new client. First, I think it helps to let you know what is involved in this kind of work. This work is not in the realm of what is ordinarily possible to get. Second, I want you to know that I go all out, but I am a plumber. When a plumber goes all out there is money involved. The job I described above came in at under three thousand, I thought that was remarkable, considering what I achieved. Third, I want you to know the way it plays out sometimes working with the public. Some people will understand, while some never do. It has become part of the challenge, this aspect of staying on the same page between effort and recompense in such a small and narrow field of expertise. Just recently I had this incredible response to my efforts to stave off financial misunderstandings. Thank you for the update. Yes I am comfortable with that amount. I've posted to you today a check for the total anticipated amount of $####. As far as I’m concerned you can deposit it immediately if you wish. Of course if there are any unforeseen expenses that come up later I'll be happy to reimburse you for them. Brian you are clearly an artist, scholar and master craftsman of the first order in your field. I admire and respect that. No matter how this ultimately transpires this has been an interesting adventure and a learning experience. My wife asked me to say that if you are ever in Atlanta, we'd like for you to come by the house for dinner. I hope this has not scared you off. On the other hand, if you thought that this is easy and inexpensive, I hope it has. I would love to explore your project further and get to the required wall supports and the parts you may actually be using. I am mentally playing with a way to upgrade this to ceramic disc by switching the rough-in valves to mid-century Crane integral spout valves, though the reach is a bit less. Thanks, Brian. BTW, this long winded response was also intended for the blog as a new post. I do not normally carry on so in my emails. Client: You have some great experience with these sinks it sounds like. I have attached a picture of some faucet handles I rounded up from deep in the workshop. 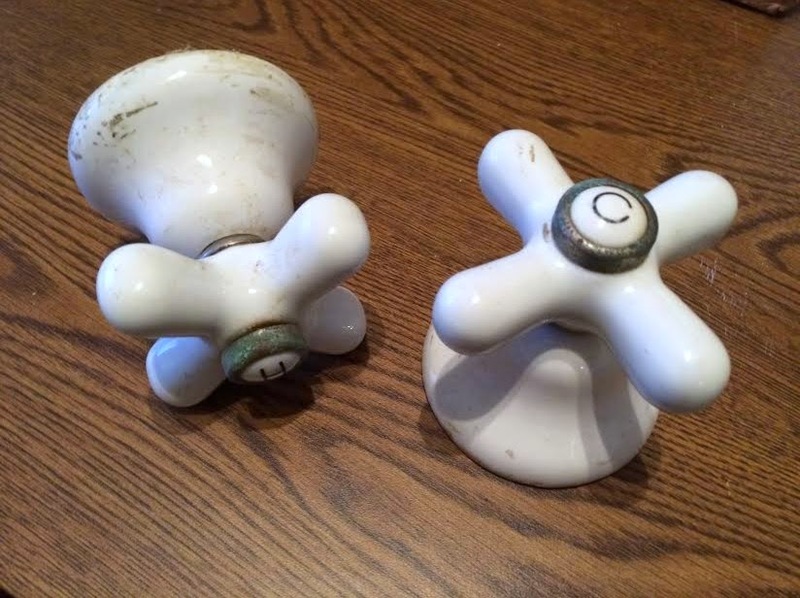 So if I can get these to work, they have a square receiver for the valve stem, all I need are two valve stems and a bracket to hang the sink on. Do you have some stems that you would sell me? Brian: Showing the valve body without the gaskets or gasket nut. I have not yet made the gaskets. Client: Those valves look like they would work. 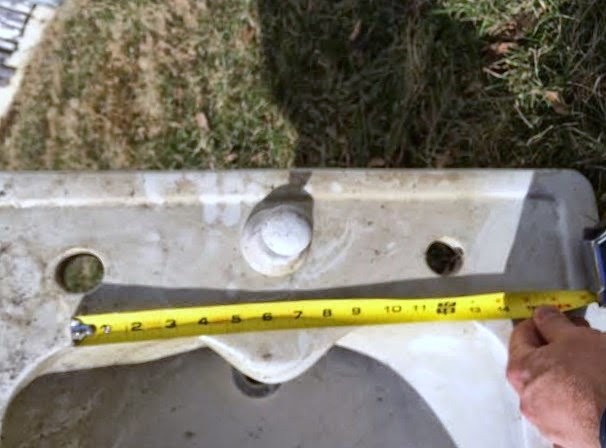 The sink holes, where the valves are installed, is about 1.5 inches. The escutcheons I have measure about 1 5/8 inches from the base of the escutcheons to the top of the square receiver. Do you think those valves will work? Are those something you pieced together? They look great. How much for a set of two if you think they would work? Also how is this mounted to the wall? Brian: This is a link to an item for sale on eBay. 20 hours left, no bids. These brackets are for holding a free standing sink to the wall. Free standing in this case means that there is a gap between the sink and the wall, usually an inch, but the sink must still be stabilized by the wall. These brackets attach to fittings that mount into holes in the rear bottom of the sink. This type of fitting fits into the china with some rubber to keep the china safe from the metal. I don't know about your trim fittings, handles and escutcheons. The valves I showed you are made for your sink. They seal with rubber above and below because the china becomes a water channel. I have not made new gaskets for them yet. I am considering a price, I may need to go back and consider my cost for the work I had done to make them. Client: I have put a bid on brackets. Let me know about the valves. Brian: The two sets of valves I have are slightly different. I am setting you up with the ones that have a longer reach to accommodate your 1-1/2" depth. I will send you a photo of one of them in a separate email momentarily. I have done my research on how much I have into these valve parts. mounting gaskets to seal the bodies into the ports in the sink, and assemble the valves. I don't think your trim will work as I cannot stay in the 1-5/8ths inch zone. The tops of my stems are at about 3". My 2" tall china escutcheons will work and I will throw those in. Square inset handles will work with them to have exposed plated stems. but your square inset handles might go onto the stems. The stem squares are .340" and are drilled and tapped for set screws. I can provide the set screws. So $780 is pretty expensive for me. I wonder what, to help rationalize the cost, I could sell the whole sink system for? Do you have any idea of what a working sink of this type is valued at? Brian: I have been trying to find one, as I have said. I was willing to pay $500 for one in good condition, shipping is always a question. Once I had it restored I would be displaying it for a prospective buyer. That is the hard part, the prospect of sitting on it till I could find a home for it. I would ask no less than $2000 and no more than $2500 for it uninstalled. That of course would be with the no metal showing look that matches the image in the catalog. That is the selling point, the recreation of the designers intended look. At this time I do not have an original drain for it and would have to deal with that as well. I know the cost of my parts and help are expense, it is a constant problem for people at the casual level of interest. Many people acquire fixtures at very low prices, because the seller has no idea, then are shocked at the difficulty and cost of completing the fixture. Even fixtures that are complete must be made to function again, sometimes after decades of not being in use. I have the original drain and stopper. It needs a little work but should be operable. Thanks and we will talk soon. Brian: Great, I will prepare the mounting gaskets. I had some other projects to finish but I got to your gasket fab. and assembly today. The valves are now tested and the gaskets are in place. There is a thin top gasket, a thick tapered bottom gasket, a friction washer, and a nut. The stems are unusual because the escutcheon hold downs are male instead of female. I thought this could present a problem for you so I cleaned up an old pair of female trims. They could use to be re-plated but they fit and I am giving them to you. I will see about also throwing in a pair of porcelain escutcheons, I have lots of them. I would like this installation to go smoothly for you. I will leave the handles to you, but let me know if you get stuck trying to find a proper fit. Here are the final photos. I will invoice you via PayPal. They look good. I really can't afford them right now, this being our slowest time of the year at our B&B. What did you say the price would be? I think you said about $700? I do appreciate your work and passion. The price was $780. I totally understand about the slow season. Epilogue: Looks like I misinterpreted "sounds great". So it goes, anyone have a Madbury for sale?